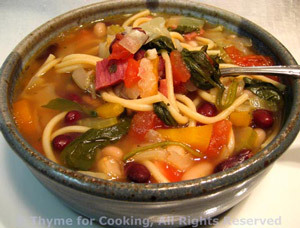 Minestrone, classic and easy, from Thyme for Cooking. Chock full of vegetables, low in fat and packed with flavor; this has been a favorite soup at our house for years. It requires very little hands-on time and fills the kitchen with wonderful aromas while it cooks - the perfect soup! This method of soaking is supposed to prevent excess 'flatulence' from the beans ....worked for us! Sort through beans, discarding any stones (never found any) or damaged beans. Put beans in soup pot or Dutch oven (5 qt capacity), add 8 cups of water, cover and bring to a boil over medium-low heat. This should take about 20 minutes. When just starting to simmer turn off heat and let sit for 3 hours. Drain and lightly rinse the beans. Do NOT use the cooking water. Put beans back in the pot, add chicken stock and water. Roughly chop the Prosciutto and add to the pot. Reduce heat to medium-low and simmer for 90 minutes. Do not let it boil hard - this could cause the beans to break-up. Uncover the soup and turn heat to medium. Chop carrots, celery and onions; add each to pot as you finish chopping. To cut cabbage, cut off a large slice next to the core. You may need part of another slice to get the 3 cups. Wrap and refrigerate the rest. Chop cabbage and add to pot. Drain tomatoes, reserving juices and roughly chop; add to stock along with juices. Cut regular ham into bite-size pieces and add to pot. Cover and let soup return to simmer. Add the spinach to the pot - roughly chopping if large leaves. Break spaghetti into 3" (7.5cm) lengths and add to pot. Cover and let finish, stirring from time to time. Serve. Refrigerate the rest for freezing and / or eating later in the week. Note: If you can get an actual ham bone (which I cannot) you can use that and plain water instead of the Prosciutto and chicken stock. Remove before adding vegetables. Note 2: In the U.S. one can buy jars of 'Ham Base' which would be good - the appropriate amount dissolved in 1 qt water. The Ham Base could be substituted for chicken stock in soups, etc. in the future. I don't want to recommend buying it for just this soup, thus the chicken stock or bone. You can make this in an hour at a hard simmer (which I do) or you can put it all together and let it simmer gently for two.... it all depends on your day. It doubles, triples, whatever easily.... it's soup! In soup pot or Dutch oven (4 or 5 qt capacity) heat stock over medium-high heat. Mince garlic and add to stock. Chop carrots, celery and onions; add to stock. To cut cabbage make a slice next to the core. You will probably use just that slice to get the 2 cups. Wrap and refrigerate the rest. Chop cabbage and add to stock. Cover and let stock return to hard simmer. Cook for 25 minutes. Cut ham into bite-size pieces and add to pot. Drain and rinse beans; add to pot. Add the spinach to the pot - roughly chopping if the leaves are large. Cover and simmer 20 minutes longer, until finished, stirring from time to time. Serve. Refrigerate the rest for later in the week. Note: In the U.S. one can buy jars of 'Ham Base' which would be good - the appropriate amount dissolved in 1 qt water. The Ham Base could be substituted for chicken stock in soups, etc. in the future. I don't want to recommend buying it for just this soup, thus the chicken stock.